Max Breton at the Beaujolais Nouveau soirée we threw at the restaurant earlier this month. I'm still at work on my book about the wines of Beaujolais - the pitch just got sent to publishers, as far as I know. And I'll still continue this blog in some form or other. 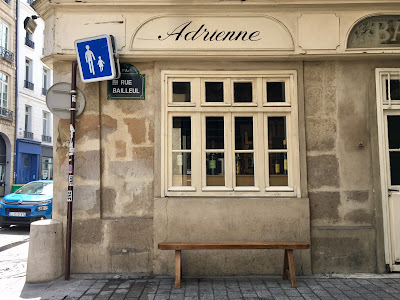 I'll write less about restaurants in Paris, and more about restaurants outside of Paris, and, of course, about winemakers. Sooner or later I'll probably debut a spiffier, more concise version of this blog. I'm awaiting the time to do that, and the money to pay a web designer. In the meantime, I invite everyone to come say hi at Chez La Vieille. I'm there almost every waking second between Tuesday and Saturday. The restaurant comprises a no-reservation wine bar space downstairs, where the full menu is served, and a slightly over-designed upstairs dining room which tends to book up about a day in advance. Unless you have trouble sitting on bar-stools, the best way to experience Chez La Vieille is to have a full meal at the wine bar. There's rarely a wait for seats, and the ambience is airier and more spontaneous than upstairs. Thomas Deck, of Deck & Donohue beers, and Beaujolais winemaker Kéké Descombes. 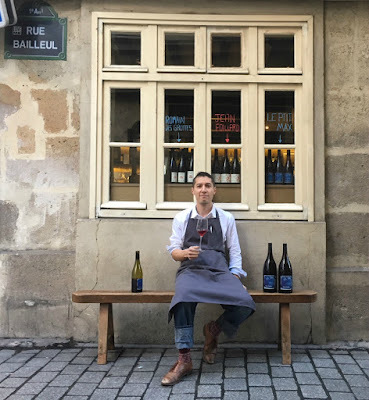 I have overstuffed the wine list with geeky small-production unfiltered French natural wines, and chef de cuisine Oleg Olexin's poker-faced French cooking is pure class. (I have only worked with him three months, and already I think I could write a book about Oleg, whose sense of humour attains the cosmic-nihilistic register of Franz Kafka.) Daniel Rose tornadoes through about once a month, being otherwise occupied with conquering New York at Le Coucou. It's been nothing but a pleasure working for him so far - we share a vision of Chez La Vieille as being a nightly party, where the traditionalist avant-garde of French winemaking meets joyously backwards-looking heritage cuisine. To be fair, before the advent of herbicides in the early 70's and the generalisation of commercial yeasts, filtration, and other winemaking shortcuts throughout the 1980's, most quality French wine was as natural as the wines we serve at Chez La Vieille. And sometime back in mid-century, before the Green Revolution, before the fragmentation of the national food consciousness, before Paris began to resemble London in the 2000's, most Parisian bistrots served the sort of homey, unshowy, pre-industrial recipes we serve at Chez La Vieille. But today - at the close of 2017 - what we do is a bit unusual. I find it inspiring enough, anyway. I hope you will too! A piece I wrote about Chez La Vieille early this past year, before I ever suspected I'd begin working there. Not everything I wrote still applies, a lot has changed, I hope. To my shame I need to admit that I know very little about wine, but your blog is extremely interesting to read :) thanks! Welcome back! Hope you'll find some time to update your blog soon. See you in Paris! So very glad you are back to writing as well, and can't wait to drink chez La Vielle!